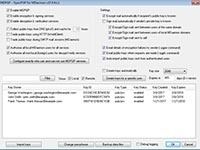 MDaemon uses a layered approach to email encryption for safely sending your emails and attachments. 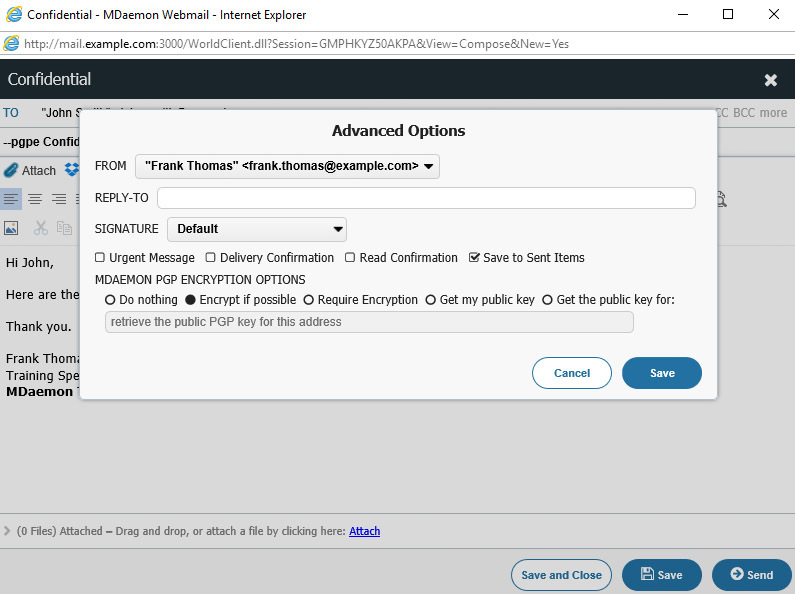 On the client-side, MDaemon Webmail users can enable basic encryption features when sending emails and attachments within Webmail. On the server-side, Administrators have the ability to use encryption, decryption, and basic key management capabilities. *Note: Customers who were using Virtru encryption can use available plug-ins directly with Virtru [www.virtru.com]. On the server side, OpenPGP for MDaemon has been added to give administrators the ability to use encryption, decryption, and basic key management capabilities through OpenPGP support. This additional layer helps administrators who want to ensure user compliance by managing encryption settings at the server versus the user implemented client level. Also, MDaemon's Content Filter now contains actions to encrypt and decrypt messages. And finally, server-side encryption capabilities are beneficial when using email archiving with MDaemon. 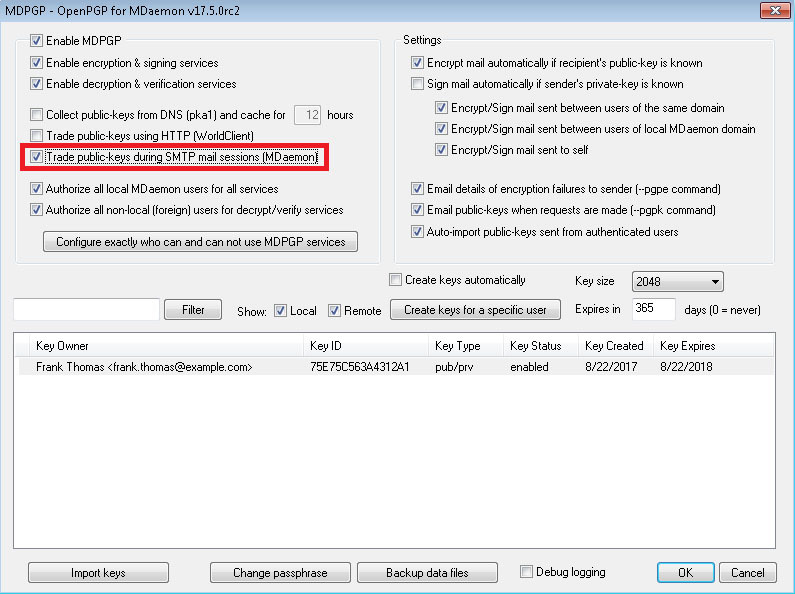 MDaemon Webmail has a unique setting that allows it to be used as basic public key server. When this feature is enabled, Webmail will honor requests for your users' public keys using a specially formatted URL. 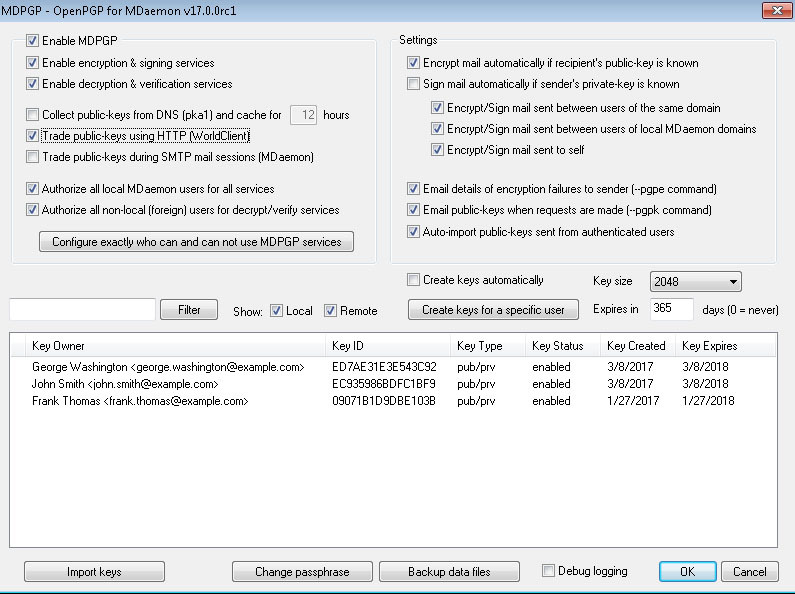 Additionally, MDaemon's OpenPGP feature supports collection of public keys over DNS. This helps to automate the process of exchanging encryption keys. MDaemon's OpenPGP features can verify embedded signatures found within messages. This helps the recipient ensure that the message is authentic. MDaemon Webmail will display an icon or text label for verified messages. Webmail will also display labels for messages with valid DKIM signatures, messages decrypted by OpenPGP, and messages signed with an OpenPGP key. Automated Encryption Key Exchange allows the process of exchanging public keys for OpenPGP to take place during the SMTP message delivery process. When this feature is enabled, authorized users will no longer need to manually send their public key to another user from whom they wish to receive encrypted email.